This one will be camouflaged - a rather rare feature on canonic VF-25s, most are either really colorful or dull grey, with some color trim, very USN-style. 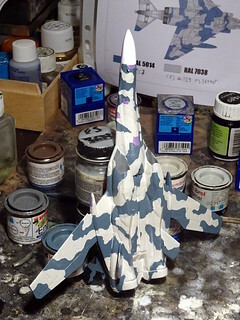 This one is whiffy/fictional, though, and I use the occasion to try out a scheme I had been wanting to "test" for a long time on a build: a wrap-around grey/blue air superiority scheme. Even though it might remind you of the scheme tested on one of the YF-16 prototypes, this one here is actually an experimental Luftwaffe scheme, tested in the late Seventies (with many other alternatives) on F-4F Phantom IIs, which eventually led to the complex "Norm '81" scheme.